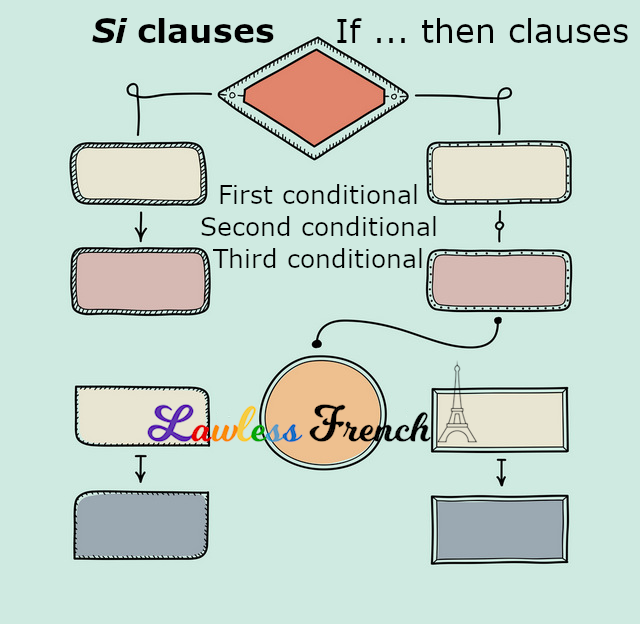 The order of the clauses can be reversed with absolutely no change in meaning as long as si / "if" stays in front of the correct verb form. This construction is useful for talking about things that happen as a rule or on a regular basis; indeed, si could be replaced by quand (when) without really changing the meaning. Le samedi, s’il fait beau, nous allons à la plage. On Saturdays, if it’s nice out, we go to the beach. Je suis grognon si je n’ai pas de café le matin. I’m grouchy if I don’t have coffee in the morning. Si tu as fait tes devoirs, tu peux sortir ce soir. If you’ve done your homework, you can go out tonight. By using the future in the "then" clause, this variation states what will happen if a certain condition is met. S’il fait beau samedi, nous irons à la plage. If it’s nice on (this) Saturday, we’ll go to the beach. Je serai grognon si je n’ai pas de café ce matin. I’ll be grouchy if I don’t have coffee this morning. Si tu as fait tes devoirs, tu pourras sortir ce soir. If you’ve done your homework, you’ll be able to go out tonight. You can also give a command based on a condition being met. S’il fait beau samedi, va à la plage. If it’s nice on Saturday, go to the beach. Achète-moi un café si je suis grognon. Buy me a coffee if I am grouchy. Si tu as fait tes devoirs, sors. If you’ve done your homework, go out.